Vintage Canada Dry Spur Drink Door Push Sign > Antique Old Soda Cola 9033. Up for your consideration is a vintage embossed Canada Dry Spur beverage metal sign. It would make a great addition to your sign collection. The sign measures 12" x 3.5" wide. 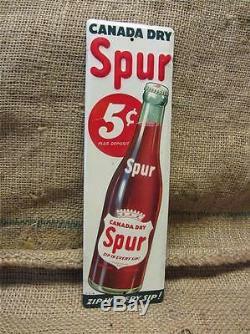 Canada Dry Spur, 5c Plus Deposit, Zip in Every Sip. It is in good condition with minor dents and minor to moderate scratches and areas of discoloration. The color on this piece is superb. See description above for further info on the condition. The item "Vintage Canada Dry Spur Drink Door Push Sign Antique Old Soda Cola 9033" is in sale since Sunday, October 12, 2014. This item is in the category "Collectibles\Advertising\Soda\Other Soda Memorabilia". The seller is "*miliki*" and is located in Red Oak, Iowa. This item can be shipped worldwide.